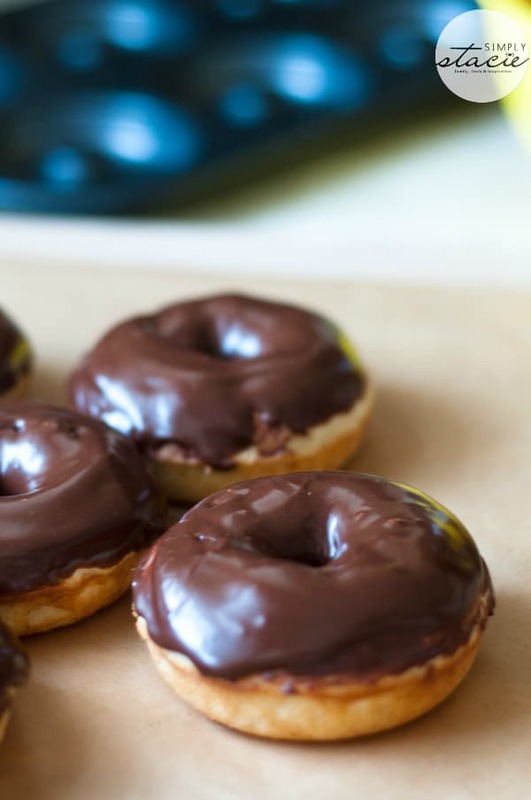 Cake Donuts with Chocolate Glaze are the perfect way to kickstart your downtime. Golden brown baked cake donuts that have a delicate and light texture. 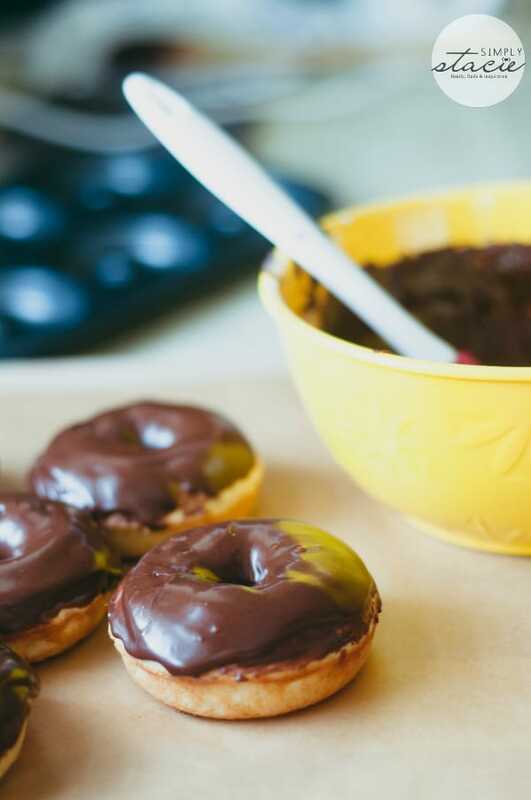 They are then topped with a homemade chocolate glaze that brings the donut together nicely! Skip the deep fryer and make baked donuts, that will curb that sweet craving. When I worked at the accounting office in Edmonton, we would have our staff meetings on Monday mornings. Whoever was the last person to arrive to work that day was responsible for bringing in a dozen donuts for the next week’s meeting. Of course, there was only one place that anyone ever went to get donuts. Tim Horton’s. 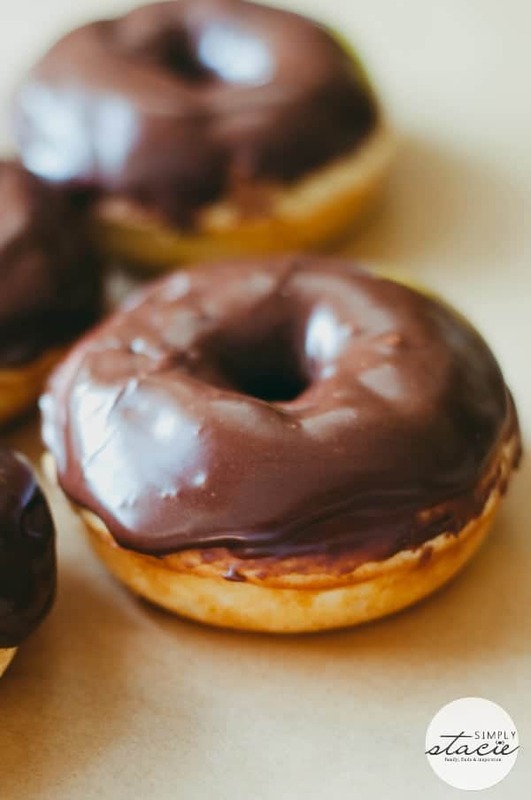 If I was still working there, I’d forgo the trip to Timmie’s and make my coworkers this delicious recipe for Cake Donuts with Chocolate Glaze. Homemade always tastes better than store bought….to me at least! I only recently learned that you could buy donut pans and bake your donuts in the oven. I know I feel dumb that I didn’t know about their existence. I had never made donuts because I dislike deep frying and had no idea you could make them in the oven. I’ve seen donut pans sold on Amazon, and they also sell them at our local Sobeys! Cake Donuts are generally a batter that is similar to a cake batter, that is piped into a donut pan, and then you bake them. You will find other firmer donuts like glazed donuts and such generally are fried overbaked. So you have to look at the bigger picture, there are a variety of donuts out there. The two most common are yeast style donuts that are raised and baked that offer more of a bread texture. Then cake donuts that are similar to cake, but a bit lighter in texture. Yes! 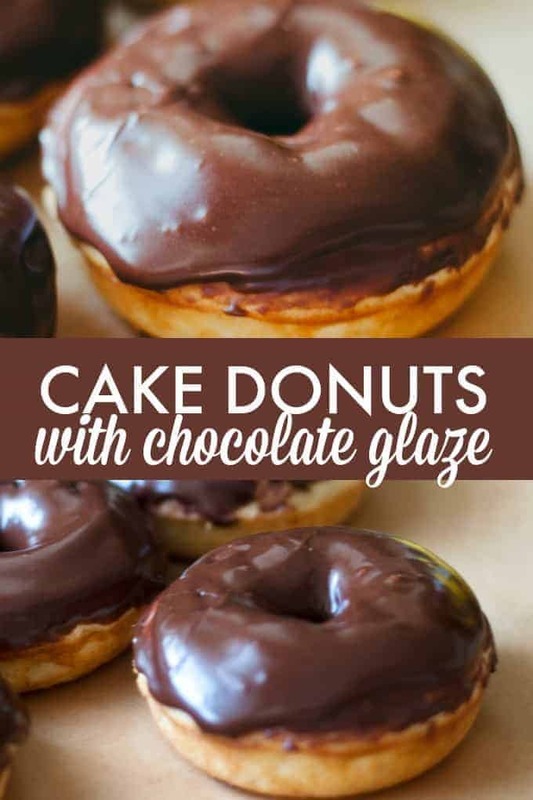 These Cake Donuts with a Chocolate Glaze freeze nicely. Just allow your donuts to cool down from the oven, and the chocolate glaze to set up. Then wrap in aluminum foil or plastic wrap and place in a freezer bag or airtight container. Freeze for up to 3 months. When ready to eat, just allow the donut to thaw at room temperature and then devour. Generally, donuts only last for 1-2 days at room temperature on the counter. You want to make sure they are sealed up in a bag to help prevent the air from drying them out. If you are making a batch of these donuts and know you won’t eat them all in time, just freeze what you won’t eat. Then, later on, you can have it as a grab and go type of breakfast! Or if you are like me, even a late night snack! Buttermilk is not something everyone keeps on hand. If you don’t have buttermilk, you can easily make your own within five minutes. Take 1 cup regular milk and pour in one tablespoon white vinegar or lemon juice. Let it sit and get thick for at least five minutes. Stir and then measure out 3/4 cup and use that for your recipe. I use this trick all the time, and it works. It won’t be as thick as store-bought buttermilk, but you will get the flavor and creaminess for the recipe that you need. This trick will work anytime a recipe calls for buttermilk. If you are like me and didn’t know a donut pan existed, you can buy a pan made specifically for baking donuts. It is a donut-shaped pan that usually has 6-8 donut hole areas. You pipe your batter into a greased pan and bake. Then you have those perfectly shaped donuts you love. 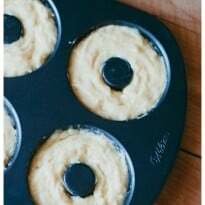 You can use a mini muffin tin to make like bite-size donuts with. You will need to adjust your baking time to say 6-10 minutes. Just make sure to check your donut holes often to ensure they don’t overbake. Stick a toothpick in the center of the muffin to see if the toothpick comes out clean if so, the donuts are done. Then glaze like you normally would a regular cake donut. Just don’t use a cupcake liner or it will stick and become a mess. As you can see this cake donut recipe is rather simple to whip up. Nothing beats a homemade donut, and these beauties right here are the perfect way to celebrate for the weekend! So easy to make with a donut pan! Baked, not fried. Preheat oven to 425°F. Spray donut Pan with non-stick cooking spray. In a large bowl, sift together all-purpose flour, granulated sugar, baking powder, nutmeg and salt. Add buttermilk, eggs and butter and beat until just combined. Fill each donut pan cavity about 2/3 full. Do not overfill. Bake donuts 7-9 minutes or until the tops spring back when pressed. Let donuts cool in pan 4-5 minutes before attempting to remove them. For chocolate glaze, sift together the sugar and cocoa powder in a medium bowl. Using an electric mixer, slowly add in the milk and vanilla and beat on low speed until glaze is smooth and pourable. Gently dip one side of the donuts into the glaze and place on parchment paper to set up. Donuts are best when enjoyed fresh. I’m a new follower — glad to have found you at Melt in Your Mouth Monday! I only recently learned about donut pans. Your pictures are super. 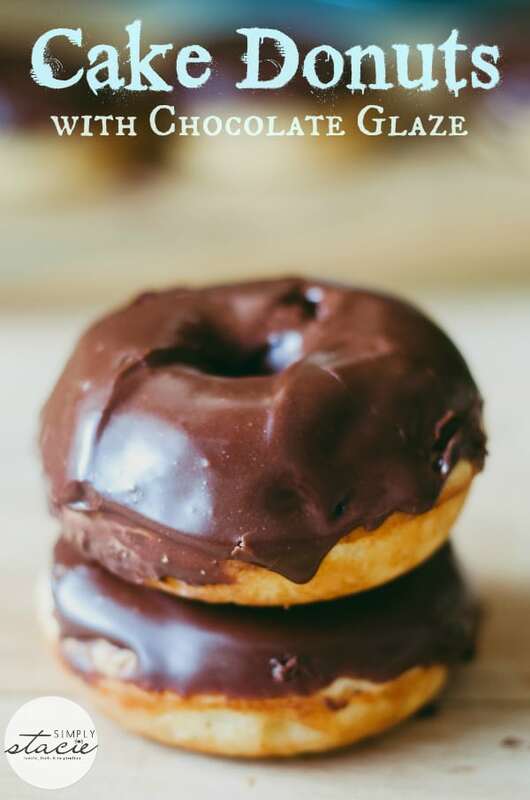 Chocolate glazed donuts are always my first choice. Thanks for sharing! I’m a sucker for a good cake donut. These look so delish! Thanks for linking up at SNF! These look so delicious! What a healthy alternative to deep frying. How many donuts does this recipe make? I’m trying to figure out the calories. These are in the oven now and it made exactly one dozen. A helpful hint to get the batter into the donut pans is put the batter into a large zippered bag, press the air out n seal. Then cut one corner to give a one inch opening. Batter can be gently squeezed into donut pans. I can hardly wait to taste them!!! i just made these donuts and they were awesome! My husband ate 2 at a sitting!! I will definitely make again (many times)!! Thanks for sharing such a great recipe! Made these last night easy and very good had 3 wright after we iced them I think I’ll add maybe another 1/4 tsp of nutmeg for a little more taste like a fried donut.